Before I get started, let me say that even though the industry has gotten out of hand with tacking “small batch”, “very small batch”, and “single barrel” labels on everything, to the average bourbon drinker, the batch and barrel “title” means a sack of grain. But I must tip my drinking hat to Jefferson’s. Small batch bourbons are designed to showcase unique flavors of specific barrels that are blended together to create a great tasting whiskey, and Jefferson’s Very Small Batch Kentucky Straight bourbon does just that. 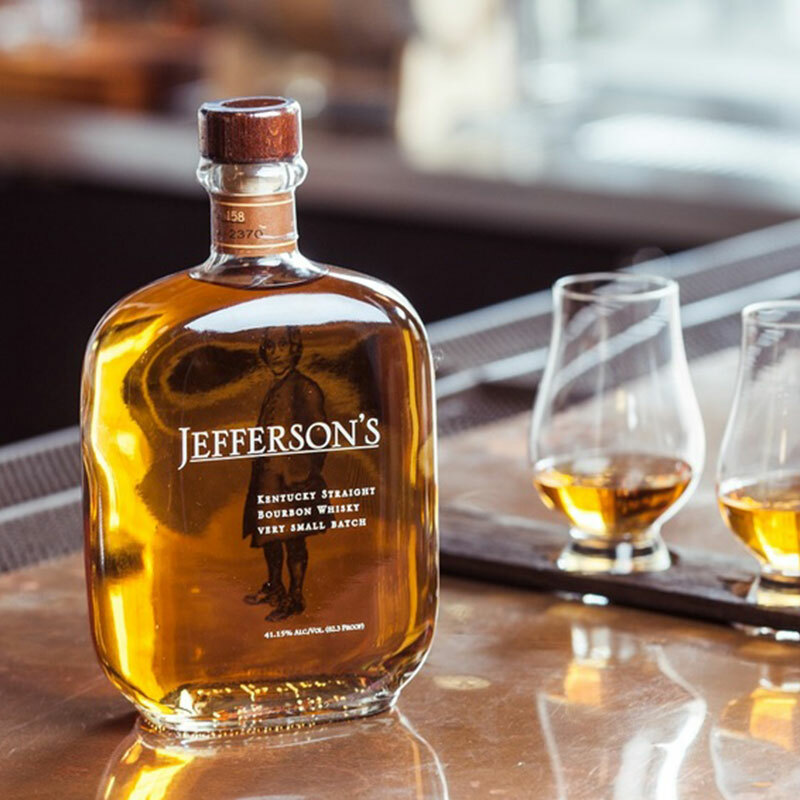 Jefferson’s is the handiwork of Trey and Chet Zoeller, a father and son team that embodies the spirit of curiosity and experimentation of Thomas Jefferson (whose image graces the bottle). While not all experiments work well (I still shudder at the thought of Woodford Reserve’s Four Wood), Trey and Chet nailed it with this one. By keeping their batches “ridiculously small” and consistent, Jefferson’s puts out a product that pleases most bourbon drinkers, both new and old. Even guests who would rather have their bottle of Makers Mark pried from their cold, dead hands have given Jefferson’s the thumbs up. After serving a few neat pours of Jefferson’s to tourists on our Urban Bourbon Trail I have gotten nothing but glowing reviews, so I was anxious to get a taste for myself. Although I lean towards higher proof whiskey’s, there’s still a soft spot in my heart for a well done, lower proof bourbon. The nose has a light, almost feinty smell to it. Think sweaty, fragrant raisins. I heard rumors of a Jefferson’s Ocean – casks of Jefferson’s Reserve aged at sea. The nose from my Glencairn has me convinced that some ocean breeze has touched this whiskey. At first sip, I’m pleasantly surprised by the fullness of this whiskey. Usually, lower proof means lower body, but with a mash bill of 60% corn, 30% rye, and 10% malted barley, there is a nice, silky smooth mouth feel and a little spice kick from the rye. After the taste of mild oak and caramel, red and citrus fruits dance across my tongue into a smooth finish of light vanilla. It’s damned hard for me to not like this whiskey. Everything about it is made to please! I give this bourbon a B-. How we grade our whiskeys. Strip leaves from 2 mint sprigs and mash with water and sugar in a highball glass until sugar is dissolved. Fill with shaved ice and pour in Jefferson’s Reserve. Stir until outside of glass is frosted. Garnish with 2 mint sprigs. Repeat until asleep. What are YOUR thoughts on Jefferson’s Very Small Batch Kentucky Straight? Leave us a review below! Thanks for the comment! I am gonna review it one more time just to make sure I wasnt off, but hey – diffrent strokes! What did you think of the Jeffersons? I have a question about this bourbon. I would like to use it to make homemade vanilla extract because my daughter is allergic to balsam of Peru. Is there any of that in this bourbon? You are safe, Carol! Just make sure you are using bourbon and not any old whiskey. By law, bourbon can have no additives, and none are present in the initial distillation process! This is a good, uncomplicated sipper. This is a bourbon to enjoy while reading or watching TV, not concentrating on a complex pour of whiskey. I get dried apricot on the nose and palate as well as tobacco mixing in with the standard vanilla and oak. Ice turns this one from a sipper to a gulper, so be careful.